I graduated from Big Spring High School in May of 1969, a couple of weeks after my 17th birthday, the youngest person in my class. My class ranking was about 100 out of 400. I applied to several area colleges and was offered a place at all of them. I applied to the Air Force Academy but didn’t get in there, probably a good thing; knowing those guys later, we called their academic experience “4 years of arrested social development.” I got a scholarship from Air Force ROTC and decided to go to Texas Tech. I never visited any campuses. My parents dropped me off at the dorm that August and were in Thailand two weeks later. The dorm was Thompson Hall. I was on the first floor, south wing. Robin Courtney and Ray Nuss were sophomores in the room next door, and my roommate was Phillip Frazee. He was also an Air Force brat and was in AFROTC with me, and also became an Air Force pilot. The dorm was where my social development really took off; when I got there I was shy and retiring. Before long Robin and Ray and I became fast friends. We took a spring break trip with a couple of other guys from our wing of the dorm (1st South-South of Thompson Hall – first floor, south wing) to Big Bend in 1970. Tommy Beal was there for sure, and maybe the Bird. We took a large aircraft survival raft Bird had and floated the Rio Grande through Mariscal Canyon, which is the middle of the three canyons in Big Bend National Park, and also the shortest trip. We put in at the Talley campground after noon sometime and floated until dark. We had driven around to Solis, the take-out campground, to leave a car, and in the process left a note on someone’s car windshield to look for us later that day. When we got to Solis there were some people on the riverbanks with flashlights looking for us. As it was dark, I don’t know how we would have found the campground and our cars without them. They were concerned about us. I didn’t write the note, but they may have had good reason to worry. One notable meal at Solis was Vienna Sausage out of a can and Pearl beer. I think I could still pick a Pearl beer out of a lineup if they still made it that way. Since we were now pros on the river, the next year at spring break we went to Santa Elena Canyon, upstream from Mariscal. We put in with two canoes and a two man raft I had purchased at the army surplus store in Lubbock. The trip started at Terlingua, which at the time had little development beyond the old general store/bar. 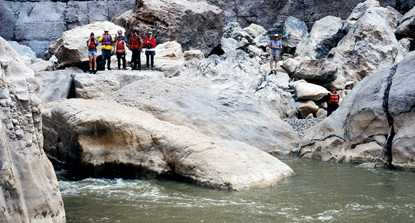 We floated to the mid-point of the canyon, The Rockslide, without incident. There were 30 other people there, all in canoes, and they decided to portage around the ferocious rapids in the Rockslide. The portage was pretty tough; up and over the rockslide with a canoe was tricky. Tommy Beal and his partner in the aluminum canoe didn’t want to go to that much effort, so they lined their boat through the rapids. Of course they had no idea what they were doing and lost the boat, which disappeared downriver. Robin and I decided our raft would make the trip, so we floated through, which was exciting, but we arrived at the downstream end intact. We made camp with the other group on the huge sandy bank on the Mexican side of the river. While drinking beer at the camp, we heard a lot of commotion; another canoe had made the trip through the rapids, and when it got opposite the campsite it ran up onto the opposite bank, where the girl in the bow jumped out and onto the beach. With her weight gone the canoe’s bow lifted up and swung away and into the current, leaving her across the river. The river was big back then, and the Rockslide was a Class 4 or 5 rapid. The members of her group were trying to throw a rope across the river, about 50 feet away, and intended to drag her back. This didn’t sound like a good plan to Robin and I, so we valiantly climbed in our raft and headed over to make the rescue. We had been drinking beer all day so it made perfect sense. We paddled furiously across the roaring river. The crowd cheered as the girl climbed into our raft. One of us almost knocked her into the river with his paddle (Robin would say that was me, but I think it was him), but we made it back safely. We were heroes! The canoe in our party was nowhere to be seen as we unrolled our sleeping bags in the sand for the night. In the morning, the river was somewhat lower, and the bow of the missing canoe appeared sticking out of the water just across the river and near the opposite bank. We paddled to it and discovered that the canoe was bent in half at a 90 degree angle. With all of us pulling, we got the canoe straightened out and stomped the bottom back into shape. Remarkably, although the canoe looked like hell, it didn’t leak. Our camping gear on these trips was minimal. I had a feather-filled army sleeping bag I bought for $10 at the army surplus store and an army surplus pup-tent, two shelter halves, no doubt left over from WWII. What cooking we did was over a campfire. We drank a lot of beer, both Coors and Pearl. On one trip to the Big Bend, Robin and I baked potatoes in the fire. They were charred, but also the only food we had left, and we devoured them. The same army surplus store also supplied my footwear for years – sneakers for $2 a pair. No one even considered taking a gun and we had very little cash. When the park ranger gave you a permit for your river trip, you just nodded and smiled agreeably when they read through the list of required equipment, much of which we didn’t have (who needs an extra paddle?). I don’t remember anyone smoking marijuana on these trips, but we did run across a few stoned people in the middle of nowhere. Robin’s car got searched by the DPS on his way to meet us at Big Bend one time, but to no avail; all they found was cheap camping gear. One time Robin left me beside the highway somewhere in west Texas because he was going home to Denton, and I was going back to Lubbock (my family was in Thailand). I got a ride pretty quickly with two guys. The first thing they asked me when I got in the old car was, “Are you holding?” I said no, mostly because I didn’t know what that meant. Of course, I wasn’t holding anyway. In those days I wore jeans, an olive drab army surplus jacket and navy watch cap when it was cold; they were both inexpensive and stylish. The two guys spent the night at our house in Lubbock and taught me how to make the egg sandwich I’ve made many times since; I’m sure that was the only food in the house. We made other trips there, driving the River Road in Robin’s Oldsmobile 88 (Yes, we understand, you only recommend high clearance four-wheeled drive vehicles). I remember being stopped on a dirt road looking at a topo map of Big Bend with flashlights as some awesome music of the early 70’s played on the 8-track in the car. Looking back on those times, I know they were in my formative years. Ever since, I have had a propensity for travel to wide open spaces and have spent my off time on rivers and trails.